The Domain Name System (DNS) is the internet’s routing layer responsible for mapping human-readable domain names (e.g., www.heroku.com) into machine addressable IP addresses (e.g., 23.21.47.33). Amazon AWS’s DNS service is called Route 53 and is a highly available and scalable service. For users with existing AWS infrastructure components it may be convenient to use Route 53 as your DNS provider. This guide will walk you through the steps of setting up your Heroku app’s DNS configuration on Route 53. Before configuring your app’s DNS make sure you’ve used the Heroku CLI to attach your domain name to the application. This is necessary, in addition to the third-party DNS changes, to properly route traffic for specific domains to the right application on Heroku. Be sure to specify all domains your application will serve, including subdomains. 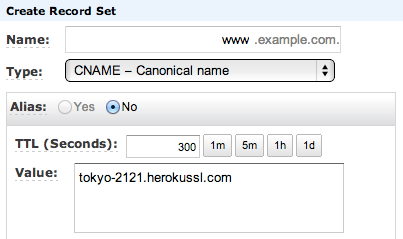 Create a CNAME record to map from www.example.com to example.herokuapp.com or your SSL endpoint if using SSL. Establish a redirect from the root domain example.com to www.example.com to avoid the risks associated with root domains and A-records. Set Route 53 servers as the nameservers for your domain. Route 53 uses different terms than standard industry parlance so this guide has non-trivial variance from other guides. A hosted zone is Route 53’s term for the collection of DNS records that make up a single domain’s configuration. You will need to create a hosted zone for each domain you wish to configure on Route 53. Sign into the AWS management console and select the Route 53 service. Click the Create Hosted Zone button and type the domain name you are configuring. Use the root domain name for the hosted zone (e.g., example.com). New records, such as the www CNAME record, are added in Route 53 as Record Sets. Select the newly created hosted zone for your domain and click the Go to Record Sets button. In the Record Sets view, click the Create a Record Set button. The Create Record Set window opens. In the Name field, type the name www (such as, www.example.com). In the Type field, select the CNAME type. In the Value field, if you are not securing your app with SSL, type the app’s default Heroku domain in the value field. 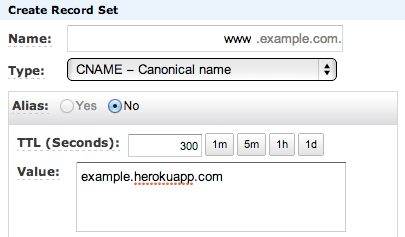 Your app’s Heroku domain is just the Heroku app name followed by .herokuapp.com. Otherwise, if you are using an SSL endpoint to secure your app, type the your-endpoint-12345.herokussl.com endpoint URL in the Value field instead. Use the heroku certs command to determine your SSL endpoint URL if you’re unsure of its value. Click the Create Record Set at the bottom of the form to save the www CNAME record mapping. S3 won’t allow you to configure an SSL certificate, so you cannot easily use Route 53 to redirect your root domain in HTTPS. If you need to do this, consider using a DNS provider that offers CNAME/ALIAS records root domains. For more information see the Custom domains Dev Center article, or this blog post, which shows how to set up a SSL naked domain redirect. Route 53 supports Alias records which use Amazon S3 static websites to dynamically resolve naked domains to their www counterparts using a 301 redirect. For example, example.com to www.example.com. Go to your AWS management console, then open your S3 management console. In order for the following bucket to appear when creating an Alias record in Route 53, you must name the bucket the exact same as the hosted zone. For example, if the hosted zone is example.com then the bucket is named example.com. Select the newly created bucket, but don’t open it. Click the Properties tab and open the “Static Website Hosting” section. Click “Redirect all requests to another host name” and you will see that www.example.com is pre-filled. If it isn’t, type www.example.com. Save the redirect settings, then open your Route 53 hosted zone for example.com. Create a new record set. Leave the name blank. Select A type. Set alias to Yes and select example.com from the S3 Website Endpoints section of the Alias Target dropdown. Your domain example.com now redirects to www.example.com in a scalable way. Using Route 53 and Amazon S3 you’ve set up a naked domain which resolves to your Heroku app. At this point you’ve established the correct DNS configuration but no requests are using it. In order for Route 53 DNS to become active for your application you need to tell your domain registrar (GoDaddy, DNSimple, NameCheap, 1&1 etc…) to use your hosted zone’s Route 53 nameservers. Go back to the Hosted Zones list and select your new hosted zone. There is a pre-populated Delegation Set section in the sidebar. These are the nameservers you need to provide your domain registrar for Route 53 to resolve your app domain. Refer to your registrar’s instructions for updating the nameservers. Supply this Delegation Set to your registrar to activate Route 53 for your application. It can take up to 48 hours for nameservers to become fully active.